Prepare to be dazzled when beholding the eye-popping colors and designs of glass artists represented by Silver Heron Gallery in Depoe Bay. From November 1 through December 24, the gallery's display of works by some of the finest glass artists is stunning. Michael Cohn and Molly Stone create lifelike apples and pears as well as whimsical pumpkins and gourds in every imaginable color. Many of Paladino-Hansen's freeform bowls have the shine and color of abalone shell. 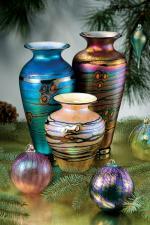 Bryon Sutherland creates clamshells and amphoras in unbelievably brilliant colors and there are also popular holiday ornaments from Lindsay Art Glass to entice glass fanciers. Prices of these various works range from $95 to $800.